Gilbert Fossoun Houngbo, former Prime Minister of Togo, has been appointed as the sixth President of the International Fund for Agricultural Development (IFAD), a specialized United Nations agency and international financial institution that invests in eradicating rural poverty in developing countries around the world. “I have come from the rural world. I have first-hand knowledge of the harshness of this kind of life,” said Houngbo, who was appointed by IFAD’s member states at the organization’s annual Governing Council meeting. Houngbo takes up the helm at a time when changing government priorities and the more immediate needs of humanitarian crises – like natural disasters, conflict and refugees – threaten to divert funding away from long-term development. With growing global demand for food, increased migration to cities and the impact of climate change, investments in agriculture and rural development will be essential to achieve the Sustainable Development Goals of ending poverty and hunger. Houngbo has more than 30 years of experience in political affairs, international development, diplomacy and financial management. Since 2013 he has served as Deputy Director General of the International Labour Organization, where he has been responsible for external programmes and partnerships. Prior to that, he was Assistant Secretary General, Africa Regional Director and Chief of Staff at the United Nations Development Programme. He is a member of the Canadian Institute of Chartered Accountants. His candidacy was unanimously endorsed by the governments of the African Union. As someone who was born and raised in rural Togo, Houngbo believes that the inequality in today’s world should never be accepted, and that IFAD has a crucial role to play in bringing opportunities to the poor and excluded. Houngbo was among eight candidates including three women vying for the organization’s top leadership position. He succeeds Kanayo F. Nwanze, who was President for two terms beginning in April 2009. 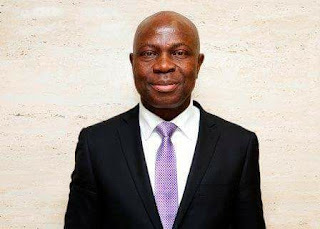 Houngbo will take office on 1 April 2017.